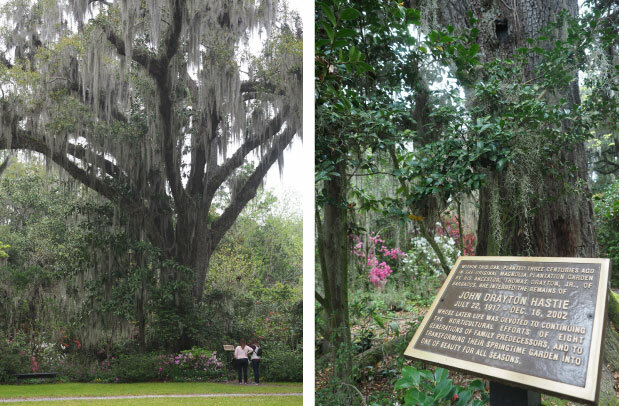 Decades ago when Magnolia Plantation and Gardens only opened the gates during the azalea-bloom season, Nona Hastie Valiunas and one of her cousins hid in the bushes then jumped out to scare the tourists. It was a playful time for young Nona who now shares ownership of the gardens that has been in her family for more than three centuries. Today, when Valiunas visits Magnolia and mingles with the tourists she looks up at a massive oak laced with Spanish moss. Standing near Magnolia's iconic White Bridge, the tree is special to her not for its beauty but for the memories it holds. A metal box high up in the oak contains the ashes of Valiunas’s father, John Drayton Hastie Sr., Magnolia's owner who passed away in 2002. "My father's tree is my favorite spot in the gardens." Hastie's death created the opportunity for Valiunas to become one of the owners of this historic property that has mostly been controlled by a male heir in the Drayton/Hastie Family. As the family's matriarch Valiunas reflects on the women in Magnolia's history who were involved in adding social flare to the gardens during the Charleston Renaissance and others who joined the fight against slavery. Valiunas explained that Ann Fox may have been Magnolia's first female owner in the 17th century. "Stephen Fox gave the property as a wedding gift to his daughter Ann Fox when she married Thomas Drayton," she said. "So perhaps it would be technically correct to say that Ann was the first female who shared Magnolia's ownership. But, in the centuries to follow, the title was inevitably passed to the oldest male heir." The family sidestepped this custom in the 1800s when one of the Drayton men had only daughters. "In order to satisfy the requirement of passing on property only to the elder son, (another Thomas Drayton) told his daughter, Sarah, who had married into the prestigious Grimké family, that he would leave Magnolia to her sons only if they changed their surname from Grimké to Drayton." Subsequently, Sarah's son, the Rev. John Grimké Drayton, who established the gardens at Magnolia in the 1840s, became Magnolia's owner and, ironically, he had no sons. He did not feel compelled by "the onus of primogeniture and, instead, left the gardens and the property to his elder daughter, Julia. Thus, the whole issue of primogeniture was thrown out the window. What had been completely unacceptable to his grandfather - leaving the property to a girl - was perfectly okay to Rev. John." Sara Drayton's marriage into the Grimké family linked the Draytons to two women who would become leading voices in the abolitionist movement. Rev. Drayton's aunts were Sarah and Angelina Grimké, prominent abolitionists who left the state because of their views in slaveholding South Carolina. "There wasn't much talk about the Grimké sisters when I was a little girl," Valiunas recalled. "What interested me most about the sisters was how completely they stepped outside their time and place. This, I believe, was very rare and requires both exceptional courage and particular timing. We are all molded by the mores of our family, our faith, our culture and our time. Angelina and Sarah walked away from everything. They left Charleston. They opposed slavery, which signified not only a repudiation of all they were raised to believe, but was also a direct repudiation of their mother and their father. I am most interested in what qualities of character come before such an exquisite leap. What creates such heroes?" When Valiunas' paternal grandmother Sara Hastie was Magnolia's matriarch the parties at the gardens drew a who's who of important people of the 1920s. The guest list included British writer Somerset Maugham, Russian novelist Vladimir Nabokov and British diplomat Harold Nicholson. They and others milled around the gardens with cocktails in hand and cigarettes dangling from their lips. "My grandmother was much more than a socialite," Valiunas said. "She was a grand old lady, outspoken, opinionated, sardonic, with a marvelous sense of humor and a good mind. She did not particularly care about what other people thought, and she placed more value on a good joke or a good book than she did on the trappings of society. In the later years of her life, she held court on the porch at 9 East Battery (in Charleston) every afternoon at 4 p.m. The door was always open, the bourbon flowed and friends young and old stopped by to pay their respects and hear her stories. She was one of a kind, a true Charleston character in a town then famous for them." In contrast, Valiunas' mother Fernanda de Mohrenschildt Hastie was cut from a different cloth. Fernanda Hastie lived at Magnolia when she passed away in 2013. She was 94. She was unique among the Magnolia women. "My mother was a kind, humble woman who seemed to have no ulterior motives and no agenda, except always to laugh and always to support every single person who crossed her path. She looked on the bright side of every adversity, and she rarely thought of herself first. No one - not a single person - disliked her." Magnolia women, Valiunas said, were smart and strong-willed. "It always has been said that the family produces one person each generation who has a particular love of gardening, a particular love for the land. Perhaps that's the greatest commonality. All the Magnolia women share that affinity with nature, that love of beauty."